Aluminum cans are the most recycled drink container in the United States. In 2013, 1.72 billion lbs., roughly 60.2 billion cans were recycled. That is a recycling rate of nearly 70%. The energy saved by this kind of recycling equals roughly 19 million barrels of crude oil. The amazing benefit of this is the reduction of carbon dioxide emissions and the reduction of landfill mass. It is certainly one of the most sustainable metals in the world, and generates the most money to the consumer who bothers to take it to an aluminum recycling center near them. When searching for a can recycle center near you try to find a facility that offers the highest payout per pound. You can try looking on the website of the local facility to see if they have advertised their payout price. You can also use the map below to find a can recycling center in your area. What makes aluminum cans so unique is that they are often recycled back into themselves, containing nearly 70% recycled material. That is 3 times more than plastic or glass. This translates into the can’s leaving a good environmental footprint. It also has a high value for re-selling, making recycling programs possible. Scrap aluminum gets $1367 per ton, as compared to plastic that only gets $310, and glass actually gets $0 per ton. Cans are also getting lighter, while continuing to stay durable. This leads to better efficiency for shipping, and eventually less waste. Aluminum can recycling has grown consistently since the early 2000’s. That being said, every year there are close to 40 billion cans that end in landfills. That’s $800 million worth of aluminum. This is catastrophic to the environment and economy. Using recycled aluminum to make a can saves 92% of the energy it takes to create a new one. Millions of homes could be powered for an entire year using that saved energy. The increase in the recycling of aluminum cans can be attributed to the addition of imported cans. This is perpetuated by the cans’ closed-loop aspect, being able to be recycled back into themselves. Imported cans cross the border from Canada and Mexico with some coming from as far as Poland and Saudi Arabia. In 2012, close to 13 billion cans came from the imported industry, which is nearly double from just five years ago. 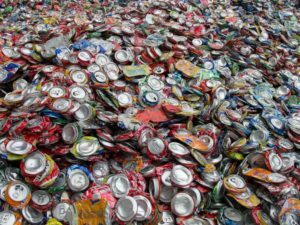 The increased rate for recycling aluminum cans is parallel to the growth in the scrap recycling industry as a whole. The US scrap recycling industry expanded from $54 billion in sales in 2009, to more than $90 billion in 2012. Perhaps it is due to the fact that it takes only 5% of the energy to produce recycled aluminum rather than primary aluminum. Whatever the reason for increased aluminum can recycling, the benefits are incredible to the environment and economy. Hopefully, this will continue, as it is imperative to lower the amount that goes into landfills every year. As humans, we should do what we can to lower our carbon footprint, and leave our future generations a planet that is not filled with tons of trash, when it could simply be recycled. It’s a simple process to start recycling your aluminum cans, and that is only one part of the bigger picture. It should be every person’s responsibility to play their role in creating less waste for our children, and our children’s children. Go out and find an aluminum can recycling center near you.